"This fun fruit plate is great for Thanksgiving. Serve with chocolate sauce or yogurt. The possibilities are endless! Prepare all ingredients and set out on a table for the kids to assemble. Makes for a fun afternoon!" Slice the pear in half lengthwise, core, remove the stem, and set each half on a plate with the cut side down. This is the body of the turkey. 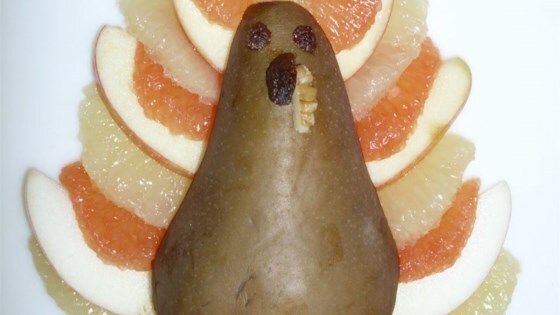 Cut 2 raisins in half to make 4 eyes, and set the eyes onto the narrower part of the pear. Cut a small slice from one end of the 2 remaining raisins, and stick a raisin below the eyes to make beaks. Press a broken piece of walnut, bumpy side up, into each pear below the beaks to make wattles. Trim the dried apricots into 4 feet with 3 fat toes, and place two feet at the bottom of each pear. Arrange apple wedges alternating with grapefruit sections in a fan shape around the top of the turkey, for feathers. So cute! I made this for my son's Christmas party at school, and it was a hit with the kids and the teachers. Thanks for the great idea! Lots of prep time with so many ingredients, but very cute! Wow! very creative, looks fun! This is just perfect in every way I can imagine. Healthy, easy,loved by everyone. Just perfect!